Currently Viewing Topic: What are some of your earliest memories from Second Life? I think that the workload for changing from one season to another would be unworkable when you're talking about hundreds or thousands of regions to be changed. Even if trees and shrubs/hedges had seasonal textures with ability to change via scripts, the script count/overhead might not be good for performance. I'd rather script time was left for residents' use. As far as I am aware, someone that you have blocked will not receive any indication of that UNLESS you have chosen to turn on "send autoresponse to MUTED avatars" (which is an option in the Firestorm viewer preferences at least - haven't checked if it's in the other viewers). There is also an option In the chat window in the Firestorm viewer for "showing muted chat in nearby chat transcript" but that is also an option that has to be explicitly turned on, and I'm not sure why anyone would want to do that... I have not tried it out, so I don't know exactly how it works or how it displays it. It seems counter-productive to block someone and then turn on an option to see what they said anyway. While many do seem to be embracing the community neighborhood aspect of the new homes, that is not the only reason that someone might choose to have a Linden home. It's a benefit that comes with premium membership, and is not limited to just those who want to be social and interact with others. While I could see some benefit to a low prim wall, nicely textured and with an appropriate width for a wall - mainly the ability to save prims - I can also understand how a tall, very thin wall could be off-putting to neighbors. It will be interesting to see how the staying in theme part of the covenant is interpreted, as well as how the community spirit ends up over time. Hopefully they will come around first thing Monday morning (if not sooner) and reset all the mailboxes that have been reported through Support tickets. This is an issue that they should be staying on top of, resetting them as quickly as possible, in my opinion, while also looking to see why it's happening in the first place and getting the bigger issue permanently resolved. Be patient and don't abandon the parcel though! If it was me and it had been over 24 hours since I submitted a support ticket, or perhaps even over 12 hours, I would contact Live Chat (even though I don't believe they can fix it themselves like they used to be able to do with the old LH control panels, it's another contact point hearing about the issue). In terms of security and privacy issues... It might actually be good for new players to initially be in a location with no ban lines and sensible behaving orbs. It will provide them an opportunity to learn to use the eject and access list tools, and to also understand that there really is no guarantee that you will be able to keep your body or your activities completely private. I remember when I first joined, I was a lot more nervous about things, and did lock things down - ban lines, locked doors on the house, orb when I was renting from someplace that provided them. It didn't take me too long to realize that, first, those might not be as effective as they seemed, and second, they weren't as necessary as I had initially thought. The parcel ban lines and the "others can see you" box unchecked used together are not quite as foolproof as I had initially thought, mainly because the ban lines do not go up very high. So someone just needs to be up over the top of the ban lines on the parcel, and then the "can't see avatar" setting becomes worthless - they can cam down into your house and see whatever... People can set their viewer draw distance high, can move their camera to locations where they can see into areas where they are not physically located, even being able to see into parcels secured from physical entry by ban lines or orbs, and even take pictures. A security orb and the "others can see you" box unchecked make a better combination, even if that allows the person to be on the parcel for 15 or 30 seconds before ejecting them off the parcel so that they can no longer see you once ejected. I'm a pretty modest person, but as others have mentioned, if you have a mesh body and go anyplace else outside of your house, others will likely see your body arrive in pieces without clothing (and even perhaps without applier layers applied yet). That can be hard to adjust to, but it's something that has to be accepted if you want to wear a mesh body, and once that's accepted, it becomes easier to not worry as much about someone else 'seeing you' while you change clothes. Granted, if someone popped into my house while I was changing or working on my shape, I would immediately eject them and perhaps even put them on the ban list for awhile, but that is a situation I have not actually experienced. Additionally, I was reminded by a post in another thread, another person can de-render your clothes and see your body. So that's another blow for the thought that there is real privacy. Personally, I don't uncheck the "others can see you" box, because when that is unchecked, you cannot see others outside of your parcel. If you want to feel like you are in a community, not being able to see or converse with your neighbor on the other side of the fence or with others walking by seems counter-productive. I often will have a little skybox up very high for when I want to feel like I have privacy, but I know that is only an illusion of having privacy. Often though, that illusion is enough to make one feel comfortable. I do think that changing the rule about ban lines with the new Linden homes will be beneficial in the long run, but I also think that change should have been made and announced prior to the houses being opened up for occupancy, not after people started moving in. I've only been here not quite 5 years, so I wasn't here for the roll-out of the first Linden homes. I have almost always had a Linden home, even when renting or owning other mainland. Periodically I would decide I wanted a different type of Linden home, and there were a number of times when not all of the house styles within a theme were available. I know that I had to keep trying for awhile for a particular Tahoe style that I wanted. So, even with the old Linden homes, it was not always possible to get the style one wanted right off the bat. Even if someone is not a "forum" person, the blogs here are one of LL's official communication channels, so setting up notifications about blog entries and/or peeking in when something unusual or new seems eminent is a good thing to do. In the announcement for the previews (and the discussions that followed here) we heard that the new homes would be "soon". Since the SSP work regions were first sighted last August by residents, there have been discussion and conjectures discussed here. When the new continent was actually created, before it opened, just looking at it, I did not think that it looked big enough to hold everyone who currently had a Linden home at initial launch, so I figured spots would go quickly. We had been told though, even before the launch, that there would be more expansion to come. Building it out in phases makes sense to me. From various chit-chat around here, people are thinking that the next release may have a larger number of additional houseboats. Hopefully this will be true, for all those wanting a houseboat. 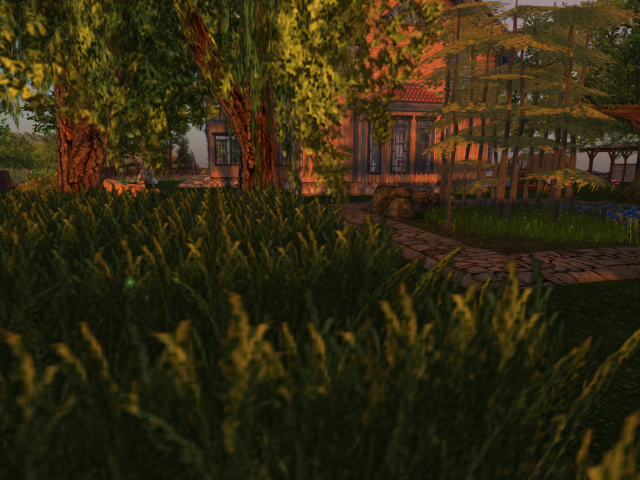 Be patient and follow the New Linden Homes Update Post (see the post above yours for the link to it). That way you'll be notified when any update is made by LL about additional homes and houseboats being available. Thank you! I like to collect flowers from all around, especially if they are not high LI. Hydrangeas in milkcans are from Simply Shelby. Purple flowers in milk can is from The Artist Shed. Potted plants on cabinet - tulips in pitcher from Dreamland Designs, peppermint plant from Shutterfield, orange orchids from Simply Shelby, green potted plant from Chic, and tulips in clear vase from Kenzielogic. Bue flowers in vase on dining table are from Simply Shelby. Spiderplant upstairs in office area from Cube Republic. I have 43 left. I would love to have more 'stuff' out around the kitchen and living room, and more plants and flowers in the yard, but I also chose to use furnishings I liked rather than what I would have used in the old Linden homes (which were low LI but not always necessarily fitting my style - and hardly any flowers or clutter at the old LH). So I'm trying to find the right balance here between furnishings I like and how much other stuff to put out for it to feel homey for me. You can "follow" this post in the forum, and if you have notifications set up for the forums, you'll be notified when Patch Linden makes any additional comments on that post: Also, periodically check to see if there are new homes available. Some people have been lucky and have checked at the right time, just after someone has abandoned one. My friend left the select you home page up on her browser, and every time she went past her computer, hit refresh on the screen for a few minutes - she ended up being lucky and getting one of the new houses after they were officially 'sold out'. There are 3 different places to set the maturity levels you want - one is in Preferences (which I think is mainly for land maturity ratings that you do or do not want to go to), one is on the marketplace (for marketplace searches), and another is on the search window itself. Have you changed it in all 3 locations?